Colloidal silver is a suspension of submicroscopic metallic silver particles in a colloidal base. Long-term use of silver preparations can lead to argyria, a condition in which silver salts deposit in the skin, eyes, and internal organs, and the skin turns ashen-gray. Many cases of argyria occurred during the pre-antibiotic era when silver was a common ingredient in nose drops. When the cause became apparent, doctors stopped recommending their use, and reputable manufacturers stopped producing them. The official drug guidebooks (United States Pharmacopeia and National Formulary) have not listed colloidal silver products since 1975. It is impossible for single-celled germs to mutate into silver-resistant forms, as happens with conventional antibiotics. Also, colloidal silver cannot interact or interfere with other medicines being taken. Colloidal silver is truly a safe, natural remedy for many of mankind's ills. Colloidal silver can be taken indefinitely because the body does not develop a tolerance to it . The ad below is from the July 1996 issue of Alternative Medicine Digest. 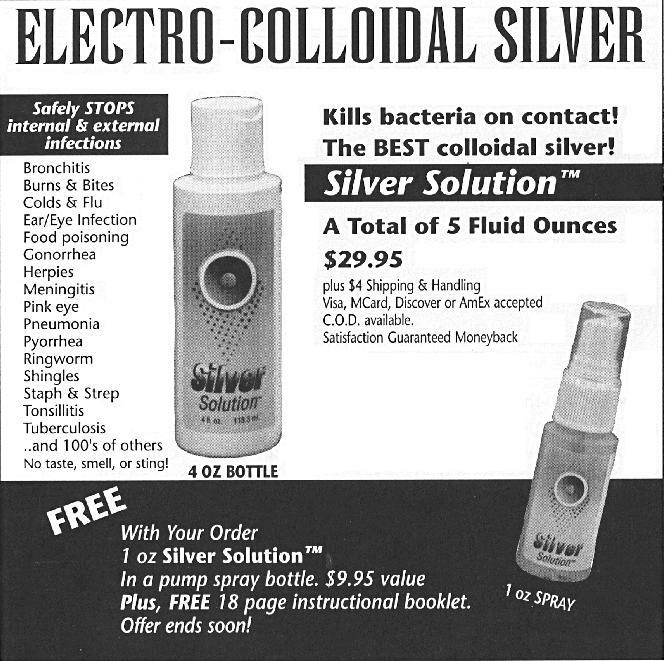 In 2019, searching Amazon.com for "colloidal silver" yields hundreds of products, many of which are promoted with false claims that they support the immune system and/or are effective against various types of infections. Two of the products were contaminated with microorganisms. The amount of silver suspended in solution varied from product to product and would gradually decrease over time. Only five products actually showed antibacterial activity in a laboratory test. To perform the test, she prepared a culture plate with Staphylococcus aureas bacteria, which can cause infections in humans. She then placed a drop from each product on the plate and used disks of two common antibiotics as controls. After eight hours of incubation, she found that bacterial growth had been inhibited around the antibiotics and four of the products. Of course, the fact that a product inhibits bacteria in a laboratory culture doesn't mean it is effective (or safe) in the human body. In fact, products that kill bacteria in the laboratory would be more likely to cause argyria because they contain more silver ions that are free to deposit in the user's skin. A 56-year-old man who had sold and used colloidal silver for three years, developed blue/gray discoloration of his fingernails accompanied by a very high blood level of silver . A married couple who had three years of daily consumption of a drink prepared by administering an electrolytic charge to a bowl of water that contained a silver bar . Another couple had been taking a silver-containing "dietary supplement" prescribed by a naturopath . A mentally ill man who had been drinking silver-containing herbal tea for about 10 months . Stan Jones, Montana's Libertarian Party candidate for the U.S. Senate, who reportedly started taking colloidal silver in 1999 for fear that Y2K disruptions might lead to a shortage of antibiotics. He made his own concoction by electrically two silver wires in a glass of water . Two men, ages 63 and 76, developed argyria after a year of product use inspired by Internet claims . A 16-year-old boy developed blue-gray pigmentation of his entire body after ingesting a silver-containing dietary supplement for a year. The product, packaged so that it was identical to bottled water. was touted as a preventive for everyday infections . A 58-year-old man who treated a presumed kidney infection with a home-brewed colloidal solution 12 times a day for 4 days developed argyria about 4 weeks later . A 38-year-old man developed argyria after ingesting approximately 16 ounces of 450 ppm colloidal silver three times a day for 10 months to treat his arthritis and other conditions. He made the solution with a simple battery-operated chamber that leached silver from pure silver wire. He had obtained the plans from information on the Internet . The photograph to the right shows how his skin color compares to that of normal skin. Higher Education Library Publications (H.E.L.P. ), of Springfield, Utah, was ordered to stop claiming that its colloidal silver product was effective as a natural antibiotic and might be effective against cancer, genitourinary diseases, tuberculosis, and AIDS. Nutrition, Inc., of Arvada, Colorado, was ordered to stop stating or implying that its Silvicidal, when administered orally or intravenously, was nontoxic, FDA-approved, and was a broad-spectrum antibiotic that killed bacteria and all virus and fungal infections. In addition, it was falsely claimed to be effective against a long list of specific diseases. Silverado Inc., of Bountiful, Utah, was warned to stop making false claims that its colloidal silver product was effective as an antibiotic, anti-inflammatory, anti-viral, and anti-fungal agent and that it could stimulate the immune system. Unic, of Carmichael, California, was ordered to stop claiming that its colloidal silver product was effective against many diseases and could heal burn-damaged tissue without scarring. Has been used successfully against diseases including AIDS, cholera, diabetes, leprosy, leukemia, lupus, skin cancer, syphilis and whooping cough. The company was also ordered to pay AUS$9000 in costs and to provide refunds . Robert C. Spencer and Lisa M. Spencer, doing business as Aaron Company (Palm Bay, Florida). Colloidal silver has been medically proven to kill over 650 disease-causing organisms in the body and is effective in curing diseases ranging from cancer and multiple sclerosis to HIV/AIDS . ForMor, Inc., doing business as ForMor International, and its president, Stan Gross (Birmingham, Alabama) agreed not to make unsubstantiated claims that colloidal silver is effective in treating over 650 infectious diseases, has no adverse side effects, and is effective against arthritis, blood poisoning, cancer, cholera, diphtheria, diabetes, dysentery, gonorrhea, herpes, influenza, leprosy, lupus, malaria, meningitis, rheumatism, shingles, staph infections, strep infections, syphilis, tuberculosis, whooping cough, and yeast infections . In 2002, the FTC obtained a consent agreement with Kris Pletschke, doing business as Raw Health, agreed to stop making unsubstantiated claims that its colloidal silver product could treat or cure 650 different diseases; eliminate all pathogens in the human body in six minutes or less; and is medically proven to kill every destructive bacterial, viral, and fungal organism in the body, including anthrax, Ebola, Hanta, and flesh-eating bacteria . Efforts should be made to curb the illegal availability of colloidal silver products, which is a significant public health issue . Reno-based Beneficial Solutions LLC and its owner Russell B. Altman have been successfully sued by women Florida and South Dakota who developed argyria after taking the company's colloidal silver product (NutraSilver). Both suits charged that the company had falsely advertised that NutraSilver was effective and that colloidal silver particles are too small to cause argyria [18.19]. The first woman also developed peripheral neuropathy, a painful condition that her doctors thought were due to silver particles they could see in nerve biopsy specimens. Both suits were settled out of court with undisclosed payment. In 2018, the company posted a notice to its Web site stating that it has closed its doors "for personal reasons." Attorney Patrick R. Burns, who handled them, can represent people anywhere in the United States and offers a free consultation to anyone who may have been injured by a colloidal silver product. Rosemary Jacobs, an argyria victim, has made a detailed study of the colloidal silver marketplace and is willing to answer questions. Product brochure. Changes International, 1997. Downloaded in 1998. Seasilver International Product Information, accessed October 12, 1998. Fung MC, Bowen DL. Silver products for medical indications: risk-benefit assessment. Journal of Toxicology and Clinical Toxicology 34:119-26, 1996. Gulbranson SH and others. Argyria following the use of dietary supplements containing colloidal silver protein. Cutis 66:373-374, 2000. Hori K and others. Believe it or not—Silver still poisons! Veterinary and Human Toxicology 44(5):291-292, 2002. Cohen LE and others. Effects of Internet quackery: Argyria in the silver state. Federal Practitioner 21(4):9-17, 2004. Wickless SC, Schwader TA. Medical mystery—The answer. New England Journal of Medicine 352:2349-2350, 2004. Brandt D. Argyria secondary to ingestion of homemade silver solution. Journal of the American Academy of Dermatology 53:S105-107, 2005. Wadhera A, Fung M. Systemic argyria associated with ingestion of colloidal silver. Dermatology Online Journal 11(1):12, 2005. Refunds for buyers of alternative therapy devices. News release, Australian Competition and Consumer Commission, May 5, 2000. FTC announces first two enforcement actions against purveyors of bioterrorism defense products. FTC news release, Feb 27, 2002. Regulation of colloidal silver and related products. Therapeutic Goods Administration Web site, Aug 19, 2003. Decision upholding complaint against Salud New Zealand. New Zealand Advertising Stabdards Authority, Feb 10, 2015. Complaint for damages. Melissa M. Gongaware vs. Beneficial Solutions, LLC and Russell B. Altman. In the Twelfth Judicial Circuit Court in and for Sarasota County, Florida. Case #30790988, filed, Aug 12, 2015. Complaint. Sandra Kaye Chrans vs. Beneficial Solutions, LLC and Russell B. Altman. U.S. District Court, District of South Dakota, Case No. 4:17-cv-04152-RAL, filed Oct 30, 2017. This article was revised on January 29, 2019.